There were activities for kids before the movie started - and we were lucky, H got her face painted and got a Mike balloon made for her, from this chap who made a huge balloon Monster hat everyone got to try - but the main reason everyone was there was to see the film, and we were told by the directors that actually we were one of the first audiences to see it in the world. Blimey! We were introduced to Dan Scanlon and Kori Rae as well as other key people who made the film before Mike and Sulley came and waved hello to us all. After that, the film - we were treated to a new Pixar animation 'The Blue Umbrella' which was charming, and will be shown alongside Monsters University (so make sure you get there in time - it's only six minutes long). So, Monsters University. What is there to say? 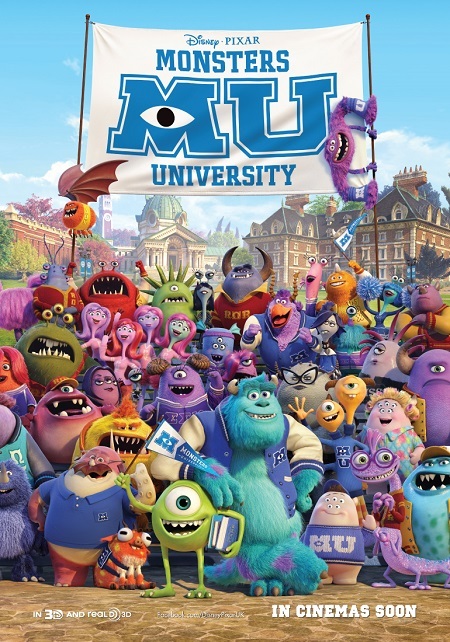 The film focuses around Mike which surprised me as I felt like Monsters Inc is definitely more of a Sulley film, but actually it works - and you find out about his background, and getting into University. 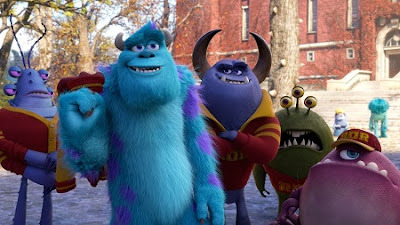 He's the hard working one who dreamed of becoming a Scarer, whereas Sully is the laid back (almost horizontal) student whose father works at Monsters Inc. Mike has the ambition, Sulley the skills. Add to that they both become fiercely competitive - and take an instant dislike to each other. I don't want to give a lot of the plot away, but going to Monsters University and being thrown out of the course you really need to get to Scare School isn't great, so they need to find an alternative way to get in - and both of them work out that working together is something they actually do well. Don't expect it to fall into the obvious conclusion either - that's what makes the film. It's a hilarious, happy film, one we enjoyed watching as a family - and was also our first 3D experience. Was it scary? Not at all. Did H enjoy it? Absolutely! It's rated U here and ends up being a nostalgic trip to University which people of all ages will enjoy - there's enough humour for a three year old and a forty three year old to laugh at the same jokes; we loved it! Monsters University is released on July 12th 2013, Certified U. We were sent free tickets to the screening of this film, all words and opinions are courtesy of Jo at Adequate Parent and they are honest and true! Thanks Jo for stepping in for us!